A tale of two retailers. Operating profits at JD Sports plunge 20% on acquisition costs while Burberry sales get a boost from strong demand in China. High street sports chain JD Sports bought struggling outdoor retailer Black Leisure from the administrators last January, and the acquisition has weighed heavily on the business ever since. The takeover knocked 18.3% off JD Sports’ latest full-year profits, which came in at £55.1m, down from £67m a year ago. Meanwhile JD Sports’ outdoor division, which includes the Blacks and Millets stores, posted a £14.9m operating loss for the year to 2 February 2013. However, the business as a whole is looking in better shape. 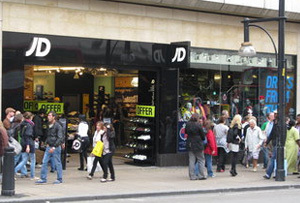 Like-for-like sales across JD Sports received a significant boost from the cold weather. Sales jumped 18.8% to £1.26bn across the group, driven by its sports business. JD has admitted the challenge of reviving the Blacks business, which it bought out of administration for £20 million in January 2012, has been tougher than expected. It has closed 122 outdoor stores in the last year as it looks to trim a high rent bill, leaving the retailer with 174 stores. This will be cut again to around 140 outlets, 10 more than JD originally planned. Around 60 of the surviving estate will trade under the Millets name, which JD now views as a good outlet for its own brands Peter Storm and Eurohike. At the other end of the retail spectrum, luxury retailer Burberry has also seen sales jump thanks to strong demand from Chinese shoppers. Sales across the group rose 13% to £840m in the six months to the end of March, better than analysts had expected.